Yep, it's summer and lately I have been doing a lot of cold soups, but this week the winds are back, the weather just a bit cooler than previous weeks and my allergies acting up. I needed a warmer, nourishing soup, but nothing too heavy for the summer season. I went to my collection of dried beans and chose some baby lima beans; putting them together with baby leeks, carrots, potato, turkey bacon and some thyme and dill. A lighter, lovely dish, this Baby Lima Bean & Leek Soup works well in any season. Heat a heavy stock pot over medium heat and place 1 tbsp oil in it. Add chopped turkey bacon and cook until crisp. Remove turkey bacon and set aside to drain on paper towel. Add leeks, carrots and garlic to pot and cook about 5 minutes until just softened. Add chicken stock, bay leaves, thyme and lima beans to pot, bring to a boil. Turn down heat and simmer, partially covered about 20 minutes. Add potatoes and bring heat to boil, then reduce heat and simmer another 20 minutes or until potatoes and beans are cooked through. Stir in turkey bacon and dill, add salt and pepper to taste and simmer another 10 minutes. 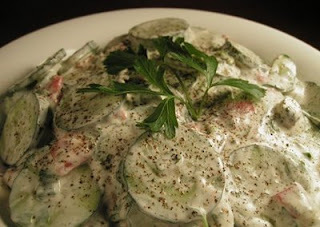 Serve in shallow bowls, garnished with additional chopped dill. Notes/Results: Hearty and nourishing, but still feels light for enough for summer, with the flavors of dill and leek. The baby lima beans add a buttery taste and the turkey bacon (I use a good quality nitrate-free turkey bacon), adds a nice slightly smokey flavor. Good for you too, with the fiber and protein from the lima beans, Vitamin A from the carrots, and manganese from the leeks just to name a few of the nutrients. Using a veggie stock and omitting the turkey bacon, would make this a good vegetarian option too. Let's see who is hanging out in the Souper Sunday kitchen this week. Kait from Pots and Plots is back this week, having woken up one morning craving soup. Wanting something on the healthy side, she put together a Sausage and Lentil Minestrone, using some turkey sausage along with veggies, lentils and little pasta shells. 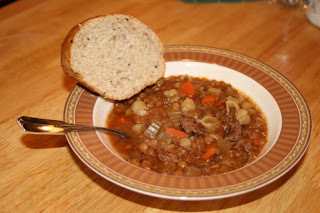 Kait says "The end result was a lovely, light and flavorful soup that’s perfect for lunch or a light supper." Trying to use what she has in the house and see how long she can hold out before going to the grocery store is Kristin at Sogkonnite Living. Using some leftover grilled steak she made into spicy curry, she then whipped up some Third Times the Charm Spicy Beef Soup. Her kids found it too spicy and didn't end up being fans but her husband really liked it! 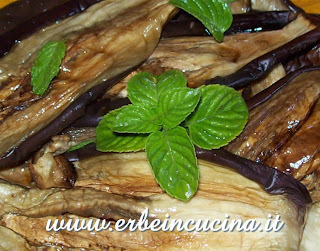 Graziana from Erbe in Cucina says "I use white mint mainly as an herbal tea, because of its refreshing aroma. It can also be used as an aromatic herb, and it's more strong than regular mint." Here she showcases it in this lovely Aubergines Salad with White Mint, a simple salad with just a few ingredients; purple eggplant (or brinjals), mint olive oil, salt and pepper. 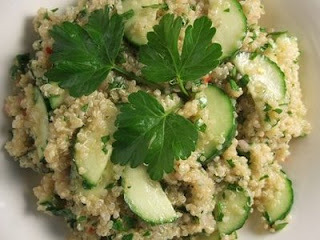 and a Quinoa Salad with Cucumber from Martha Stewart. Natashya says, "Cucumbers are great to eat in the summer or with spicy foods, they are cooling and their high water content keeps you hydrated." A big fan of the cucumber myself, they both look delicious to me, as does the cucumber cocktail she posted wth the salads! A small group this week but some delicious soups and salads to share. If you have a soup, salad or sandwich that you would like to showcase at Souper (Soup, Salad & Sammie) Sundays, click on the Souper Sundays logo on the sidebar for all the details. I could really go for your soup right now. It has cooled down here. I just woke up from a Sunday nap and I am starving! Yay for bacon! I haven't found turkey bacon here, but anything that says bacon has to be good. Your soup sounds wonderful. So comforting, so flavorful. The round up was a good read as always, love checking in on sundays here. Great round up. Everything sounds delicious. Great round up, as usual! Keep up the good work! Your soup is chock full of goodies! I haven't made soup in a while and suddenly have a craving looking at these! Hopefully I'll get back in the round-up this week. What a hearty soup! Perfect for summer. It all looks delicious. Fell better. Delicious round-up, and your soup looks great! Ooh this looks so wholesome! You've got me craving something hearty and good for you like this now, heh.